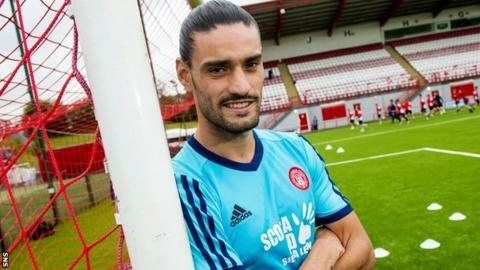 Spanish forward Salva Chamorro has left Hamilton Academical less than a month after he joined the Lanarkshire side. The club had announced the signing of the 25-year-old on 15 July. "Following an issue with international clearance, which wasn't going to be forthcoming in the short term, the player Salvador Perez Martinez has returned to Spain," the club announced on Twitter. "The club have cancelled his proposed registration at SFA and Fifa." The statement continued: "It is not anticipated to be resolved shortly. The club have therefore ended their interest in the player and wish him the best." Chamorro had moved from Lleida Esportiu in Spain's third tier, having scored 14 goals in his last campaign. He began his career with the development teams at Villarreal.